I really enjoyed this book. Sort of a thriller/mystery genre book. A journalist, Mikael Blomkvist, is convicted of libel and then hired by a gentleman who wants to know who murdered his great-niece… and he assumes that the murderer is someone within his very own dysfunctional family. 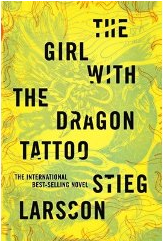 Helping the journalist is an extremely gifted hacker, Lisabeth Salander, who apparently is a common thread in Mr. Larsson’s 3 novels. What starts off as a single mystery branches into several threads before things are concluded… though not as I would have expected earlier in the novel. I started this book after reading “The Reader” and was not quite prepared for the rather twisted Nazi/WWII connections in this book… that said it truly was a great book and I look forward to reading the other 2 novels in the set as they are released in English.